Piroska (Pauline) Carey of Hoey, SK, passed away peacefully at the Rosthern Hospital, December 15, 2018 at the age of 94 years. Piroska was born to Joe and Elizabeth Barna in Budapest, Hungary on January 8, 1924. She leaves to mourn her passing and cherish her memory, her son John (Rose-Marie) Carey of St. Louis, SK, her grandchildren: Christine (Scott) Hamilton, Melodie (Tom) Edwards, Roberta (Orville) Sinclair, and Jonathan (Nicole) Carey; 10 great grandchildren and her brother Zolie Barna. Piroska was predeceased by her parents Joe and Elizabeth (Nagy) Barna, her husband Lesley, her son Steve as well as numerous relatives. A Funeral Service will be held in the Chapel of Kushneryk Funeral Service in Wakaw, SK, on Wednesday, December 19, 2018 at 1:30 p.m. Interment of the Urn will follow in the South Hill Cemetery, Prince Albert, SK. Donations in memory of Piroska may be directed to the Bellevue Care Home. Funeral arrangements have been entrusted to Marc Blondeau of Kushneryk Funeral Service, Wakaw, SK, 306-233-4403. 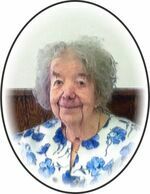 To send flowers to the family of Piroska "Pauline" Carey, please visit our Heartfelt Sympathies Store.